apedroid: Trust us! Why? Because we say so. Trust us! Why? Because we say so. This is going to be follow up on a post I did a month ago because I found something interesting. 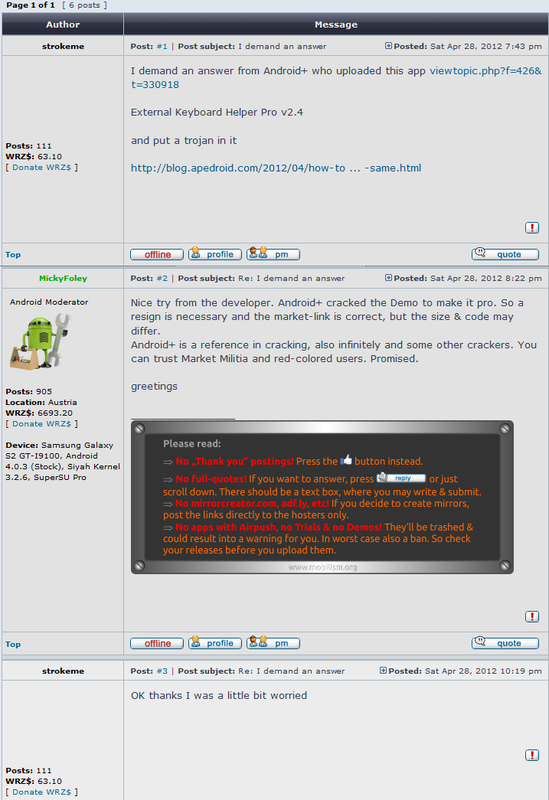 In a forum focused on pirated app releases I found a thread that linked to my previous blog post. I originally planned to post an answer in that thread but the thread was locked for some unknown reason. My comments on the second post is that it was not the demo version made pro. I've examined the untouched files and it's the pro version, no doubt about it. Someone told me these kind of guys uses "cracking" tools and it is of course very possible that this is people just using premade cracking tools to "crack" apps, not even knowing what these tools adds to the apps. I've tried to find out but the added code cannot be reverse engineered with the tools I've tried. I also want comment the phrase "Nice try from the developer". The reason I started to google for my app in the first place was because sales suddenly doubled overnight and it stayed higher than normal for 4-5 days after the "cracked" version appeared on the net. It has happend once again just a week or two ago and the same thing happened then and I can still see the positive effects in my sales numbers. I wouldn't even have made the post if it had not been for the fact that the app was modified and resigned and I wanted to make people aware of the risks. I can only speculate on why the sales increases when this happens but these pirate app releases replicates on a lot of sites, blogs and forums quickly and they even seem to run it through Google translate making it available in several languages. They "spread the word" and I suppose a lot of people actually uses their brains. My last comment is about the line "You can trust Market Militia and red-colored users. Promised." And the answer to that "OK thanks I was a little bit worried". I'm not saying these guys are all bad and totally untrustworthy people but I wouldn't take an anonymous persons word for it, especially when the reasons he/she put forward for the modifications and resigning are false. No wonder people get scammed on the net.